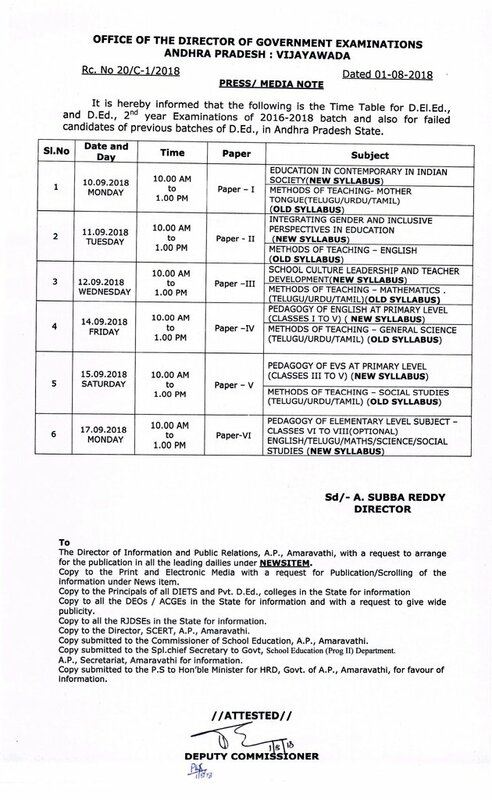 Exams for AP D.Ed 2nd year Students: Director of Government Examinations Board, Government of Andhra Pradesh State has announced the D. Ed Second year, 2016 -2018 batch examination fee schedule in the month of August 2018 and these schedule is applicable to failed candidates in earlier D.Ed batches to appear these exams. The Board of Secondary Education AP officials had already informed to all the principals of D.Ed Colleges that Second year exams will be conducted in the month of September 2018. The AP D.E1.Ed., 2nd year Examinations for 2016-18 batch candidates and D.Ed. once failed candidates of earlier batches are to be conducted from 11-09-2018 to 18-09-2018 and the Hall-Tickets are being hosted on this office website www.bseap.org. Exams for AP D.Ed 2nd year: While communicating a copy of the time table for Special Examinations for D.Ed., 2. year scheduled to be conducted in the month of September 2018 from 10.00 A.M to 1.00 P.M. To take all necessary measures for conduct of the said Examinations. Steps shall be taken to give wide publicity to all concerned. Question Paper and OMR Sheets will be dispatched as per schedule. A responsible Officer shall be deputed to receive the confidential material with instructions to meet the Deputy Commissioner concerned by 10.00 AM on the said date. Now, the BSE Andhra Pradesh, Director of Government Examinations, Director has announced the Diploma in Education Second Year Annual Examinations 2018 Time Table in first week of October month 2016. These D.Ed annual examinations will start in the month of September 2018 and Failed candidates that means old batch of students also came take part in these examinations. These examinations will be held from 10.00 A.M to 1.00 P.M. The Director has clearly indicated that the only students of AP may have followed the same methodology. Students have download their Hall tickets and to attend the Exams directly. In case of photo missing on the Hall ticket, Candidates to meet the concerned college principal along with apassport size photo for affixing at the space given and get the attestation of the Principal. Further, one passport size photograph affixed on A4 size white paper with signature of the candidate under the photograph duly writing the Roll Number shall be sent to this Office immediately along with a covering letter, failing which candidate's result will not be declared. Directorate of Government Examinations is an independent department functioning under ministry of secondary education, Government of Andhra Pradesh. The department is responsible for conducting the SSC/OSSC Public Examinations and a number of minor examinations as well. Major examinations: According to the official website, DGE's office conducts SSC/OSSC examinations twice in a year. For any query regarding the results, candidates can visit the official website. is it correct time table? Paina Unna Time Table Taatkalikamainadi Official Time Table Tvaralone Issue chesthaaru.. Yes this is Correct Time Table..
Thankq sir by given information. D.ed 2nd year exams time table. sir, when this time table will available in govt website? When will they keep official time table in website "bseap.org"? 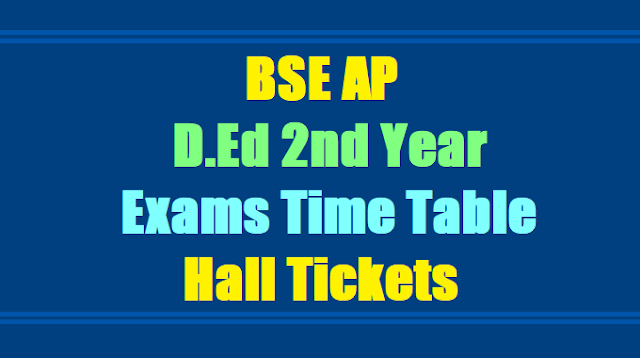 AP D.Ed 2nd Year #HallTickets will be placed in this middle of month. still now hall tickets r not isuing by authorities.is d exams started on 4th november?r dhy wil postphoned? Sir pls tel d ed 2nd year exams are postponed ? Why they don't give proper information, system is working or sleeping??? Sir Exams postponed or not kindly give the reply plz. when will release official time table..plz tell me sir..
sir present timetable cnfirm or not...? sir, there are full rains and flood in and around chittoor , nillore ............... no proper train and bus facilities to attend the exams . So, please post pone for few days. sir exams are conform or not???? plez..post pone exams no transport..
andarike ( spot admissions ki kuda ) hall tickets vachesaye, Raledani evaru chepparu information. No trains to chittor , nellore, cudappa places students r from those places very difficult to come to exams. Sir.plz.upload spot admission students hall tickeats & 1st year results..... thank U sir.. Flash news a channel lo? English and Telugug Medium lo untundi.. In which language SGT question paper will be in AP? Vemula Santosh sir please let me know "In which language will DSC (SGT) exams will be conducted ? In telugu or in English or in both? Thanks for your quick response sir. This is my last question sir, kindly answer me. where can I get Dsc study material in english language for all subjects in DSC. 2nd Year Exams Attend kaani vaariki(90+) ee special exams ki attend kaavali...(veeru admit aina colleges ki permission ledu..veeri bavisyattunu drustilo pettukuni govt veeri koraku special ga exam conduct chesthunnadi). may be, Govt DIET Staff received official news...Vaaru cheppinatlu..vinandi...Exams maathram attend kaani vaariki maathrame. Present AP D.Ed 2nd Year Special Exams 2016 jarugabothunnayee..Ee Exams Complete kaagaane mee results announce avuthaayee..
We have technical police constable physical rest on 7 Nov 2016 and same day we have science methods exam. 2nd year Ded exams avvaledhu..mari memu DSC ki eligible eyna?